A normal day at Courageous Sailing Center, as usual, Laura and I pull up a lobster trap, unfortunately empty as it occasionally is. 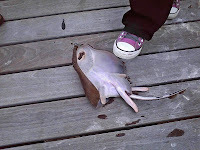 We decided to catch a quick lobster to show the kids, so we threw a frozen, bloody mackerel into the trap. The mackerel, which had been in the water for about a week, was sure to attract a lobster or two, so we thunk at the momentous occasion. After rigging up our sails, we realized that the trap had yet to be pulled up, so Laura decided to run over with a few kids to check on it. As I was pulling up the jib, slowly and methodically, really hoping the day would end I heard a shriek from behind me, "Rob get over here look at this! It's alive! How is it alive?" Now, seeing as Laura is generally friendly and having a cool, collected way of dealing with any situation, I was appalled and mildly concerned by her shouting. I jumped off my boat, slipped, almost lost a brand new TopSider to the fighting deep blue, and eventually saw Laura now mobbed by the kids at Courageous, with a living, cavorting, strangely familiar mackerel. Yes folks, fatty fish can be caught, bloodied up, and frozen for days and still be revived by a cold splash of water. This was something the amazed looks at Courageous learned about 15 minutes after this incredible fish came "back to life". Most of us stood in awe, watching this immortal fish flapping around in its own Resurrection Tomb. Kids jumping around the dock, screaming "Oh my god! We're gonna be on TV!" and "No! That's not the same fish! That's impossible". But it was possible, that fish did resurrect in it's own way, as we were calmly told by an unsurprised Courageous staff member as word of the miraculous fish hit the upper dock, which, in all our clamour, took mere milliseconds. However, in the wake of our small, dockside stampede, we learned a few things after we tossed the everlasting fish back into the water. First off, as aforementioned, that fatty fish can survive through weeks of being frozen, (unlike humans, specifically Austin Powers for all you fans). We discovered that a fish does not die as it gets caught, and thirdly, that despire our forewarnings, the docks at Courageous can surive a mob of prancing children. I have found that love is the harbor and the community which surrounds it. I am writing to you on my last day on the job and looking back, I have nothing but fond memories. I am happy that I had the opportunity to take a summer job that gave back to society. 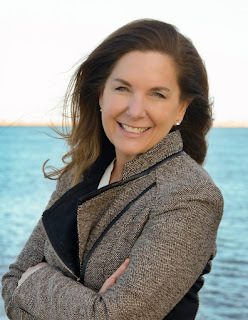 I will cherish the times I spent untangling fishing lines for hours at Camp Harbor View, practically running a marathon with children on my back at Eastie, wading into the salt marshes with Quincy kids, climbing over the treacherous rocks at Southie, and gobbling down cookies at Dorchester. 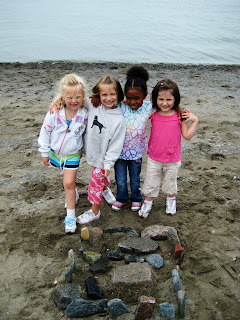 Giving the children (our future) a chance to explore the ocean and the wild life, is truly a magnificent thing. I will most certainly miss the kids I have educated and my comrades in the field, the office, and the dance party in the supply closet. I would like to thank everybody for the good times. Hi it's Marissa and sadly today is the last day at work and I am truly going to miss it until next year. I had such an awesome time working with all of the awesome people at Save the Harbor and I loved all of the kids that I worked with as well. I am so sad that this summer is over. I think out of this whole summer and out of the many awesome things that I got to do and the awesome places I got to go I honestly have to say I had the most fun at South Boston. This has been one of the most awesome summers of my life. I got to work outside and with awesome kids that loved fishing, crabbing, and just made the job worth while. I can't wait for the awesome summer next year. I really enjoyed this summer and its really going to be hard to top it. 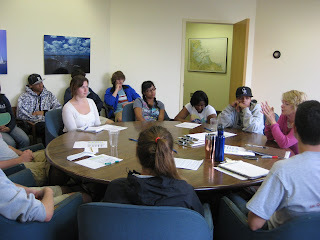 This is the last day of the youth program at Save the Harbor/ Save the Bay. Most of the staff is here to say their goodbyes. I had an amazing time this summer. 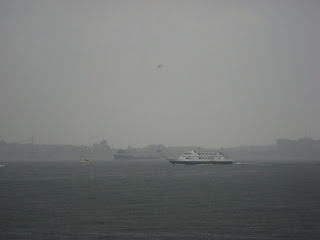 Going on the All Access trips, Camp Harbor View, and Quincy was really great. The Harbor Islands provided me with a rollicking good time. Throughout my journey here as a staff member for this selfless non-profit the joy was constant and ubiquitous. Could my summer have been any better? Could I have guffawed in a more vivacious manner every day with the amazing staff here? All signs point to no. Today in office cleanup we hung up all the signs various kids have drawn throughout the summer and a plethora of memories came rushing into me, filling me with a sense of joy I had not been witness to in a few months at least. All the shining faces of all the jovial youth who came out to the Bank of America Pavilion and how overjoyed they were to be drawing and learning about the marine life they were about to see; I am rarely so proud of myself. To see my own work fill kids with knowledge an curiousity, I do not think I could ever feel such a gift upon my shoulders. I can't wait to do this again next year!! Hey it's Marissa, and I'm here to talk about all of the fun things that I got to do for this last week at Save the Harbor Save the Bay. This week I got to do so many cool things. Some of them being able to go on all access, going to East Boston, and even the East Boston out reach program. Out of these many things I would have to say the most fun thing was going on All access. 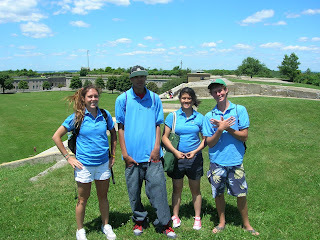 I got to go on the all access trip to Spectacle Island on Wednesday with Jason, Alice, Ibriham, and David. When we got to Spectacle all we really did was swim because it was so hot out that's all that everyone really wanted to do. And I'm sure everyone else had a lot of fun that day. This week I worked at South Boston and All Access. 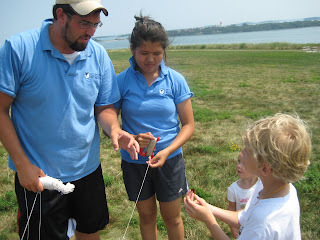 Even though we didn't have that many kids at South Boston we had fun fishing and crabbing. This picture is of the only sea star we found at South Boston all summer! 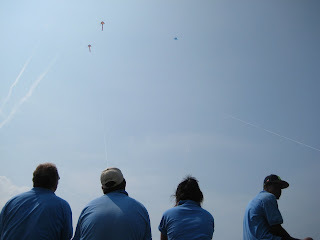 At All Access we flew kites and all 5 kites flew high in the air and it was fun. Ross and David played keep away with me and Thi. Even though they were toying with us, we didn’t give up! It was really fun. They were really good at keep away, so we only had about a 1% chance of getting the ball, but it was fun anyway! That's it for now. Today Ross, Rob and I were at East Boston. The kids there were so active and excited. When we first got there we played a game of capture the flag. It was really fun and the kids seemed like they really enjoyed it. After our fun game we went down to the dock to crabbing, on the little rafts, or to just see w hat we could find around the dock. The kids really liked being on the rafts. They also liked seeing what they could find around the dock with the dip nets. 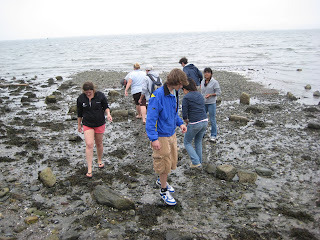 They mainly found mussels, seaweed, anthropoids, and a whole bunch of other critters. After our fun journey down at the dock the kids wanted to get wet because it was so hot out. So we took all of the kids to the water fountain. They had a lot of fun there getting wet and being able to cool off in the cold water. I also had a lot of fun today. This morning was an extremely exciting morning over at the Bank of America Pavilion. Yesterday we baited our lobster trap with a mackerel (a type of fish) and this morning we hauled up the trap and found not 1, but 2 lobsters in the lobster trap. Not only were we able to share the lobsters we caught with the kids, but we were also able to share them with my hometown and Dorchester’s very own City Councilor Maureen Feeney! It was great she was able to come and show her support. The kids enjoyed her presence. The kids were also enthused about watching the lobsters in the touch tank. One of the lobsters we caught was a decent size and the other was an infant. The kid's curiosity and interest was accompanied by many fun and interesting questions. One of the kids was a lobster "expert", so we let him answer the questions he knew. This was a fun learning experience for everyone. Let's hope we have another catch (or two) tomorrow!! I can't wait to see. 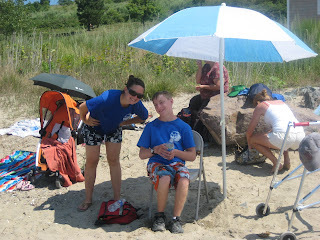 Last Saturday Save the Harbor/Save the Bay was at the Dorchester Beach Festival at Malibu Beach in Dorchester. 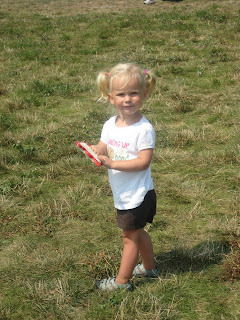 The festival was a wonderful family event, complete with food, music, and of course fun at the beach. We took the kids down to the shore in waves and caught heaps of hermit crabs and loads of minnows. The event was a huge success. The weather was beautiful and everyone had a great time. 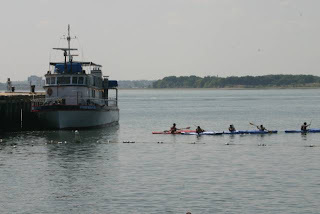 The kids and their families had so many activities to choose from, including exploring the harbor, kayaking, sailing, and fishing. Marissa even had her face painted with the SHSB logo. Yesterday I had a chance to watch new fishers try their hand on the Fort Point Channel! I worked with Save the Harbor this summer on water quality in the Fort Point Channel, and Fishing 101 at the Boston Children's Museum was our culminating event. I collected water samples over the summer to evaluate the quality of the water in the Channel. The results show that the Channel is clean enough for fishing almost every day! We had a group of summer staffers out on the Channel to help teach families and visitors how to fish and to bring Bostonians back to the water. Adela and Jasmine joined us from Worcester. We had visitors from Tyngsboro, Worcester, Revere, Newton, Braintree, and much more. It was a successful day as people from all over Massachusetts came to enjoy the Channel and catch some fish! Bruce Berman and some of our fishers admired their catch. We hope to see even more people for Fishing 101 next summer! 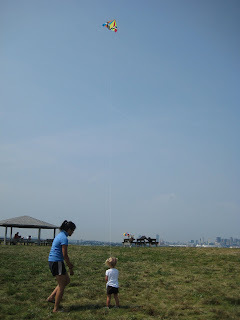 I had a spectacular time over at Spectacle Island, it was so fun, we had food on Bruce's boat, and he took me fishing. I really wanted to catch a striped bass fish but I got no luck. But I felt special when he asked me if I wanted to go fishing. We went swimming, played Marco Polo and played catch - it was just so fun. I have a serious tan! we work so hard to restore and protect. Here's my crew and a couple of guests for last Monday's Fishing 101 at Children's Wharf. As always, the crab traps were a big hit! everyone had fun - and we actually caught some (small) fish. See you all again on Monday. I'll bring the bait! Today Marissa, Alice, and I attended the North End Family Pride Day! We saw some great singing and dancing, bocce, the Bruins Bear, and even ate. As you can see Alice and I had too much fun at arts & crafts. Most importantly we caught a female rock crab, a female green crab, and a one clawed lobster. It was a wonderful event and I cannot wait for next year.